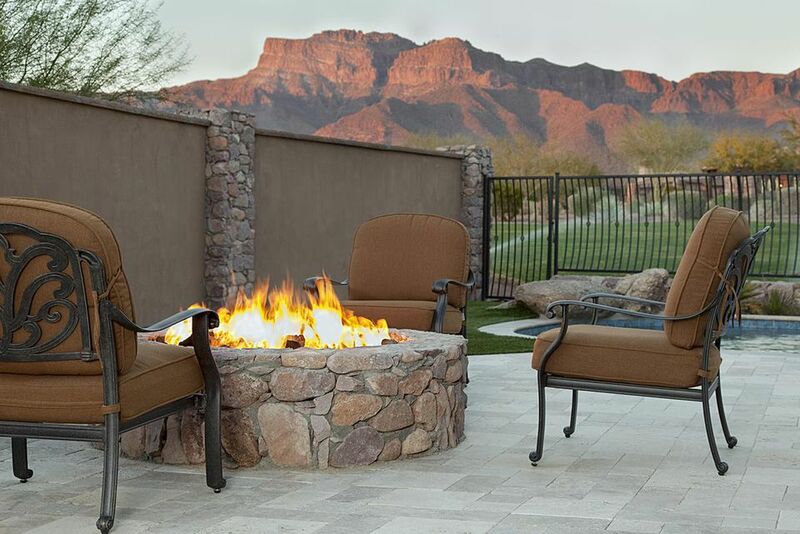 Before buying your fire pit, make sure you understand your city or county’s regulations regarding their use. Some cities prohibit their use completely, and hefty fines could be imposed if you don't follow the rules and regulations. Read the manual that comes with your fire pit and follow instructions. Call the manufacturer regarding any questions you might have. Always keep a fire extinguisher handy and make sure it is in good working condition and not close to its expiration date. Use safety gloves when handling a hot fire pit. Watch this video on how to use a fire extinguisher. Avoid placing your fire pit near hanging branches or on an unsteady surface. Start your fire small and only use the recommended fire starters. Never use gasoline to start a fire. In a wood-burning fire pit never pile on wood too high because you don’t want burning pellets to spill out. Children should not be allowed near fire pits, which should be supervised by adults at all times. Never leave the fire unattended. Make sure to extinguish the fire completely once you have finished using it. Follow your manufacturer’s instructions. Use a fire extinguisher or enough water to let the hot coals or wood soak. Continue to pour water over the fire until there’s no steam. Cover with a lid if you have one after you have put the fire out. Do not store the coals or wood in bags right away; use a metal ash bucket instead.use a metal ash bucket instead. Once you have mastered the rules about safely using a fire pit, it's time for the fun part: creating the decor for the ambiance you want. If you revel in the campfire experience, surround the fire pit with large rocks casually laid around it and stacks of firewood. Add rustic chairs for seating. Create a minimalist decor with a sunken area covered with gravel for the fire pit with raised, built-in wooden benches surrounding it, great for late-night conversations. For a modern look, use large limestone boulders to surround a mound of gravel with a fire pit in the center. Use modern outdoor furniture to finish the look.